The latest installment of the podcast comes courtesy of San Diego musician Joel P. West. Check the review of Joel’s new album, Dust Jacket. ENJOY! i started making this list by trying to collect all the songs that have influenced me the most but immediately realized that it was going to have to be a super-deluxe box set and gave up. i noticed that all the songs that move me the most have a wintry feel to them and started thinking about why i am drawn to quiet and delicate music with bells and strings and choirs. i find it fascinating that these songs do not fit my current setting at all; the measly hints of winter that we get in san diego are few and far between and the seasons have to be forced with decorations and special menus. i get overwhelmed with emotions whenever i get a weekend somewhere crisp and cold and always do a lot of pondering and reflecting. i think we often use the novel to hold memories and emotions; we need sacred places to keep our deepest thoughts. i have come to venerate true winter moments as a san diegan and i think it is evident in both the art i appreciate and the art i make. here are some songs to accompany the leaf-less parts of the year. 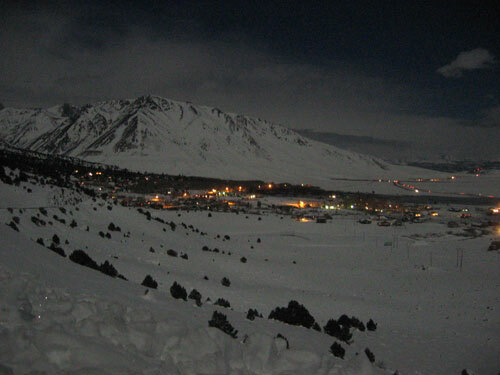 the photograph is of crowley lake at night (up by mammoth) where a lot of these nostalgic memories are kept. i was walking around at night listening to icelandic music and thinking it looked a lot like iceland (i hadn’t been there yet).